Kayak fishing is a very popular sport and we are guessing that as you are reading this, you are starting to show an interest in this activity. If you already fish, the chances are that most of your equipment will adapt to kayak fishing although there will be some changes to be made if you are used to power boat fishing. There are lots of things that you need to be aware of before you begin your kayak fishing journey, such as safety equipment and clothing, but above all you will need to decide what type of kayak is best for you. You can enjoy a more intimate fishing experience that is more at one with nature. There are 3 main steps that you need to take in order to make sure you choose the correct kayak. We hope that you find exactly what you are looking for and we are sure that once you start kayak fishing you will be hooked! 1. The first thing that you need to consider is the type of kayak fishing you will be participating in. 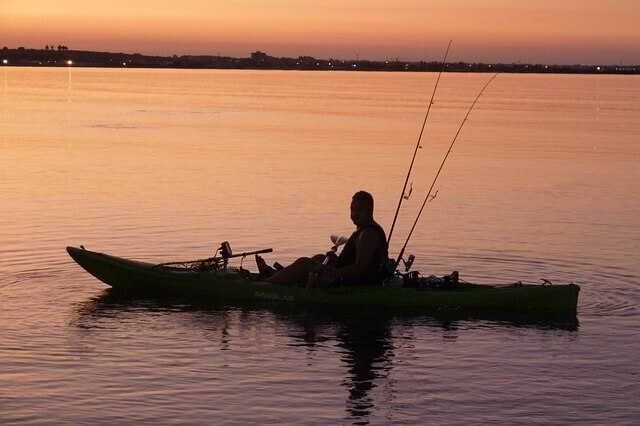 There are many styles of fishing kayaks on the market that are specifically designed for anglers. There are some kayaks that are better than others, but that will depend on your specific needs. You can go kayaking in freshwater or saltwater. It is imperative that the angler chooses the right kayak to suit the condition that they will fish in, or else they will risk putting themselves in danger and the likelihood is that you will not catch much fish if you do not do your homework. A kayak places the angler at water level, allowing you to get very close to the fish. This invigorates your senses and magnifies your fishing experience during the pursuit and act of playing a feisty fish. A kayak places an angler as close as possible to your quarry and its environment. The main factor in freshwater fishing is that the current will propel you forward so you may come across debris and rocks along the way, meaning you need to be quicker when , maneuvering. Shorter, wider kayaks that you sit in are best for this type of fishing as they add to the stability. Inshore waters are defined as waters next to a shoreline with a depth of 70 feet or less, so bay and inlets for example. As the kayaker will need to paddle over long distances and are likely to meet with stiff winds and steep waves at, longer, slimline kayaks with a good level of rocker are best for this inshore saltwater fishing. Offshore kayak fishing is for those who want to fish in the open seas and oceans. As a guideline, offshore kayaking will be defined as 70 + ft. Kayaks that paddle in open seas are bigger than from freshwater fishing kayaks as they need to be stronger and avoid any corrosion by the salt in the water. A longer length kayak can help offshore saltwater anglers as it can provide a more stable kayak. Sit-in kayaks move a lot faster than sit-on kayaks and require less effort to paddle than sit-on-top kayaks do and therefore, indicating that a day-tour kayak may be most suitable for this type of saltwater fishing. Sit-on-top, day-touring and recreational kayaks are the three main types of kayak that anglers use. Sit On Top Kayaks are very stable and easy to paddle for everyone including new paddlers through to experienced paddlers. In addition, these types of kayak can be used on the sea, estuaries, rivers, lakes and canals. This type of kayak is different from other types of kayak as it does not have a cockpit and the hull has a self-bailing drain holes. The hull of sit on top kayaks has a double wall to trap air inside of the hull making them impossible to sink. It is not difficult to get on and off these kayaks, making them perfect for beginners. At around 15ft, sit on top kayaks are very stable although they should only really be used in calm water. Reasonably priced, very stable, easy to maneuver, tough and durable. Some come with storage. Plastic models are very heavy, they are quite slow, user is left open to tough weather conditions. Day-touring kayaks are usually 14-18ft in length and a little narrower than a light-touring kayak, so as to offer the best forward speed & tracking. This does mean that there is less ability maneuver in this kayak, but it offers great capacity for expeditions and camping trips. They are much faster than standard kayaks, for the specific purpose of traveling far distances. Day-touring kayaks consist of bulkheads, holds, and watertight hatches to offer good floatation and can paddle in rougher waters. Good hull design, making it easier to propel. Good level of secondary stability, they are built to hold medium loads, and are relatively safe in rough seas. Increased safety due to holds, hatches and bulkheads. Good storage. Quite compact, lower degree of initial stability, high price tag. Recreational kayaks are often referred to as touring kayaks and they are designed for those who like to paddle for fun rather than competitively. Like sit on top kayaks, they are ideal for lakes and calm waters, but will be suitable for the occasional long run. The clear difference with the recreational/touring kayaks are that they are much shorter than most other kayaks, making them easier to handle, both on and off the water. These kayaks are very user friendly and comfortable for novices and those who want to stick to lower levels of kayaking. Reasonably priced, stable, good to maneuver, and durable. An enclosed cockpit allows the user to enjoy some protection from rough weather. Low degrees of secondary stability and they are quite heavy to move around, much like sit on top kayaks. Initial stability, also known as primary stability, defines the steadiness you have when the boat is flat. A flat bottomed wide boat has lots of primary stability. Slim kayaks have a low degree of initial stability. Secondary stability is a measure of how stable a kayak is when you lean it over to one side. This makes slim kayaks stronger in terms of secondary stability and soft-chinned katas generally have a lower level of secondary stability. Length and width affect the speed and maneuverability of kayaks, due to the differences in surface area. Kayaks that are long and thin line allow kayakers to slice through the water quickly which is a real advantage if you plan on touring, but a drawback on twisty rivers. A 17 ft kayak will go much faster than a 9 ft kayak, but a 9 ft kayak will turn easier than a 17 ft kayak. A slimline kayak is faster than a wider one, but wider kayaks tend to be more superior in terms of stability. Kayak maneuverability relates to how fast and how efficient your kayak is able to turn and react to paddling. Generally, short kayaks that are flat at the bottom are a lot more maneuverable. Rocker measures the hull curve, from the center of the kayak to the end of the hull along the keel. Therefore, hulls with a low degree of rocker will be pretty straight along the keel and hulls with an increased degree of rocker will be highly curved. Tracking relates to straight the kayak move. Good tracking occurs when the kayak travels in a straight line after you cease paddling. In general, you have cannot get a kayak that tracks well and also is good at maneuvering. We hope that our guide to choosing a fishing kayak has been of use to you and that you have come to the best decision for you. All kayaks will require a significant investment so be patient and make sure you choose wisely. Here’s to many great fishing expeditions and lots of great catches in your kayak.